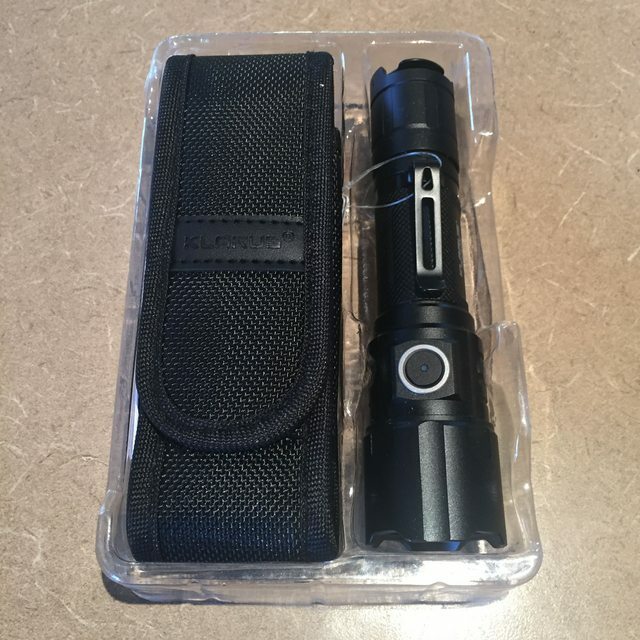 The XT range of flashlights from Klarus is popular with the consumer market. The FX10 is a zoom light, based on the non-zoom XT series lights features. Lets see how it performs. The Klarus FX10 was send to me for an honest review by FastTech. Product Link. Enter coupon code “MAP” in View Cart page for a better price. The Klarus FX10 arrived in Klarus branded cardboard box. Included accessories include a micro USB cable, lanyard, spare O-ring, Klarus branded 2600mAh 18650 battery, nylon holster, and clip. My review sample came without batteries (due to shipping regulations), and thus the testing was performed with a Klarus 3600mAh 18650 battery. The Klarus FX10 has a very similar appearance to the XT11GT, with a head that is larger than the battery tube. The USB charging point and side switch are located on opposite sides of the head, and the tail has a dual tail switch – primary switch and mode switch. More on the user interface later. The Klarus FX10 is a zoom light, and thus the head can be moved to zoom the light (unlike the fixed head XT range). The zoom mechanism is moved by twisting the head. A quarter turn moves the zoom from flood to throw – this is much better than other twist to zoom lights I’ve used such as the Haikelite MT07 that require considerably more twisting. It is possible to hold the light and zoom the head with one hand, but not as easy with a push/pull zoom mechanism such as the Ledlenser P7.2. On the good side, it is difficult to accidentally zoom the light unless you are intending to. 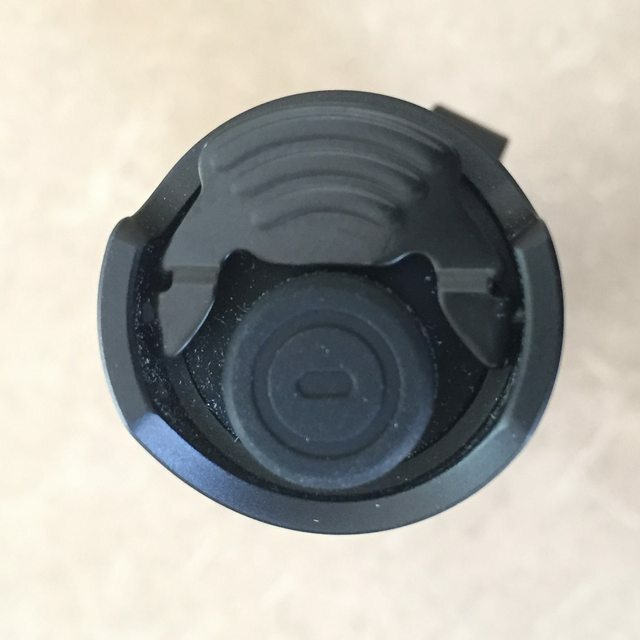 The battery tube has springs at both ends, and is bored wide enough so both unprotected flat top, and protected button tops fit with no issues. The included 2600mAh battery is a bit low capacity by 2018 standards. I tested the internal USB charger to terminate charge at 3.16V, which is at the lower end of acceptable. A crude battery charge indicator light (70%) in the side switch can be useful so that you know when to recharge the battery. The price of the Klarus FX10 is also reasonable. Due to distribution networks, zoom light manufacturers such as Coast, Ledlenser, and Walther Pro have highly variable prices depending on the country of sale (Australia being one of the worst). Thus how the Klarus FX10 compares to it’s rivals in terms of price will vary on the country. 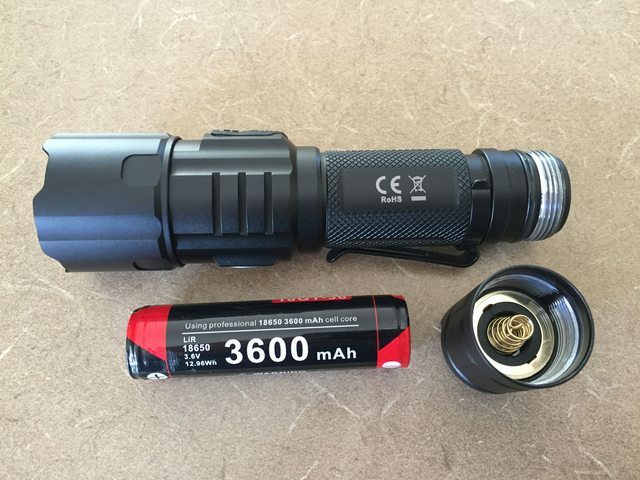 Only Wowtac (A3S) offer a high quality 1000 lumen zoom light at significantly lower price. The Klarus XT11GT has two mode groups – Tactical Setting and Outdoor Setting. There are also three switches – the primary (button) and mode (paddle) switches at the tail, and a side switch. Due to the considerable options in the user interface, I won’t cover every possible user interface option, but will provide an overview of what can be done in each of these mode groups. Tactical Setting (1) allows for momentary on turbo (primary switch), momentary on strobe (mode switch), direct access to low mode, single frequency strobe (if mode switch is kept depressed for >4secs secs), two frequency strobe (if mode switch is released after 4secs secs), ability to change modes (but no memory), and SOS mode. Outdoor Setting (2) allows for momentary on turbo, momentary on low, ability change modes, mode memory (single click of side switch to turn on in memorised mode), strobe (double click of side switch), and SOS mode. Unlike the XT11GT, there is no Advanced Tactical Setting (3) which allowed for only turbo and strobe modes, with momentary for both, and deactivated side switch. Thankfully, it is still possible to de-active the side switch by holding it down for 6 seconds, and 3 quick clicks to re-activate. To move between modes, the user needs to hold down the side switch for 10 secs, and then use the mode switch to change between modes – the light flashes out the mode number. The user interface is quite complex, and a read of the manual and a play is definitely required before using it for the first time! 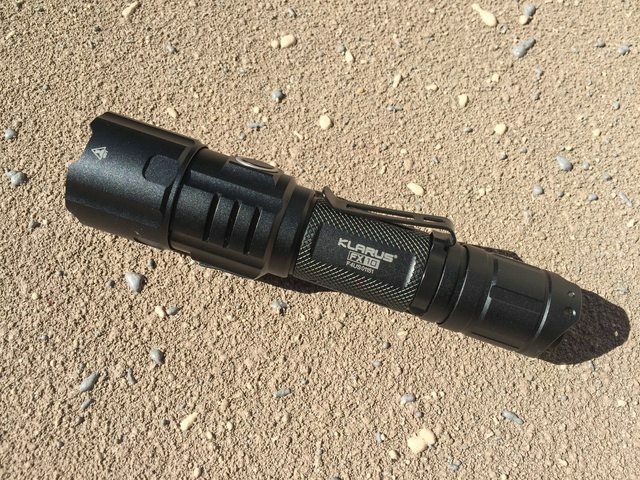 A major omission is lack of momentary functionality on medium and high modes – this is available on the Nitecore P10GT and MT22C, Thorfire TK15S, Thrunite TC12v2, and Wowtac A1S. This functionality would have made this light more useful for light drawing in various light conditions. It is also a little bit fiddly to exit single frequency strobe back to turbo on the fly (you need to hold, release, then click again). The Klarus TRS1 remote tail switch (optional extra) allows for extra flexibility in control. 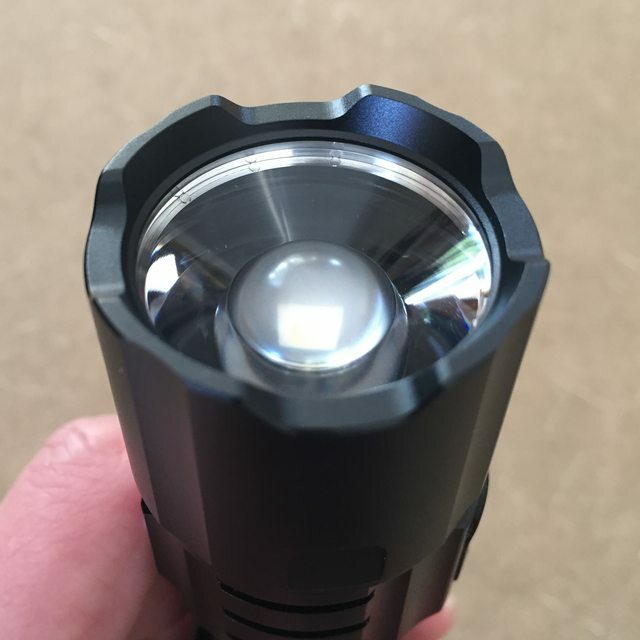 The TRS1 can also be used on some other Klarus lights such as the XT11GT and XT2CR. 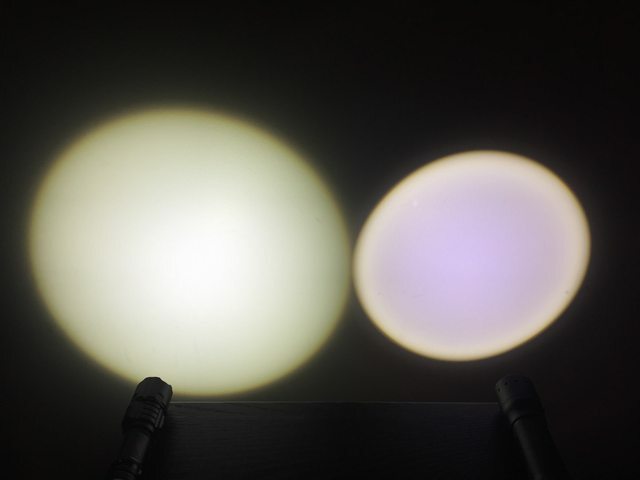 The Klarus FX10 uses a Cree XP-L HI V3 LED. This LED is located below a TIR lens with no reflector. 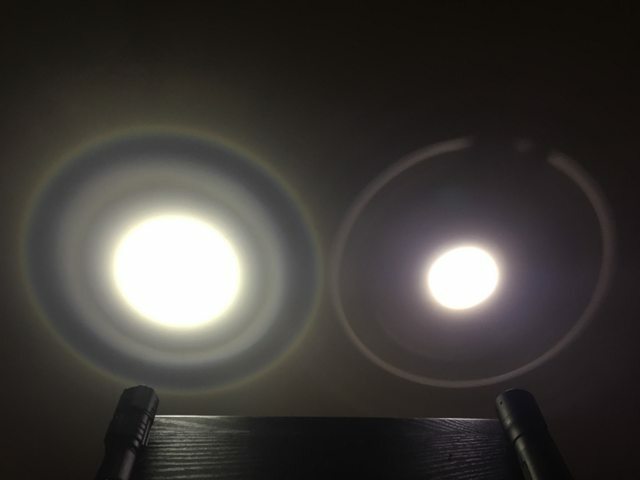 These optics look similar to many Ledlenser, Coast, and Walther Pro zoom lights. The advantage of using a TIR lens, compared to aspherical lenses found on cheaper zoom lights is that less light is lost within the head when at the zoom end. At the flood end, the beam is very wide and even, quite possibly the best flood beam I’ve seen on any zoom flashlight. At the zoom/throw end, there is a very intense hotspot at 22,500cd. This is however less than dedicated thrower lights such as the Convoy C8/C8+. Unusually for a zoom light, there is still quite a significant spill beam. There are advantages and disadvantages of still having a spill beam at the zoom end. 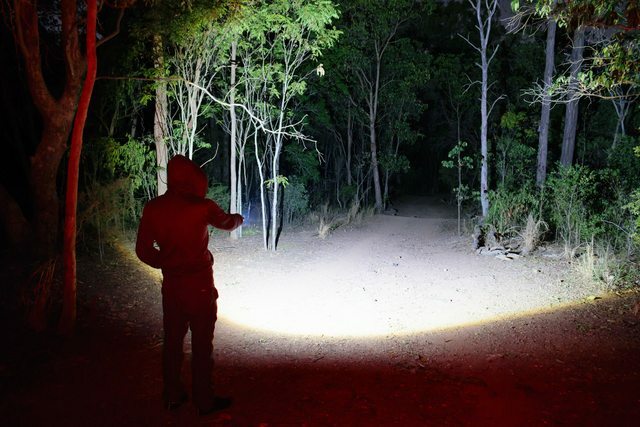 Advantages are that it is better for illuminating light painting tools, and allows for some illumination of your next step when walking at night. The disadvantage is when using it for object illumination purposes, you have less fine control of the beam. 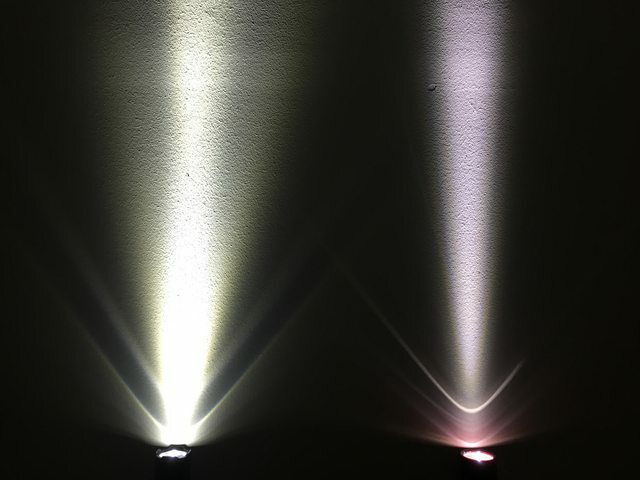 Beam comparisons – Klarus FX10 on high mode 350lm (left), Ledlenser P7.2 on boost mode 320lm (right). The beam tint is cool white with a hint of yellow, more so nearer to the edge of the beam – Klarus always do a good job of selecting good LED tints. There is minimal tint shift at zoom/throw, and only a very narrow yellow corona at flood. 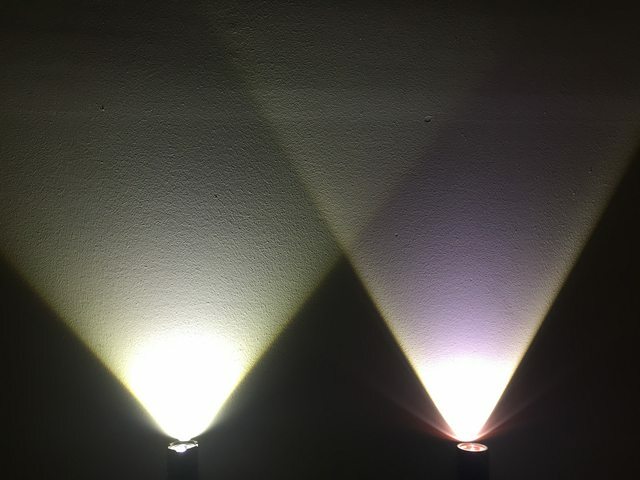 The output levels are turbo (1000 lumens), high (350 lumens), medium (100 lumens), and low (10 lumens). My testing was within 10% of these figures at 30 seconds. No moonlight mode is an omission. Strobe mode uses 1000 lumens. The Intelligent Temperature Protection System controls the output on turbo mode based on heat. It took 5 minutes until the light started stepping down output. 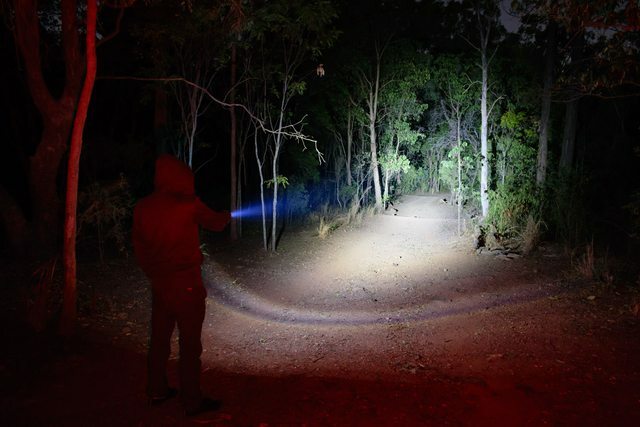 This is much better than the 1000 lumen Ledlenser MT10, which steps-down after just 30 seconds. After 5 minutes, the FX10 then varies output between 65 to 85% based on the temperature based control. Colour rendering is in the usual low 70s, good enough for most purposes. Pulse Width Modulation (PWM) was not detected in any mode. - No momentary functionality on high and medium modes. The Klarus FX10 is a well built zoom light. A good zoom mechanism, optics, flexible user interface, and internal USB charging make this light an attractive option. A spill beam at zoom may or may not be a deal breaker. 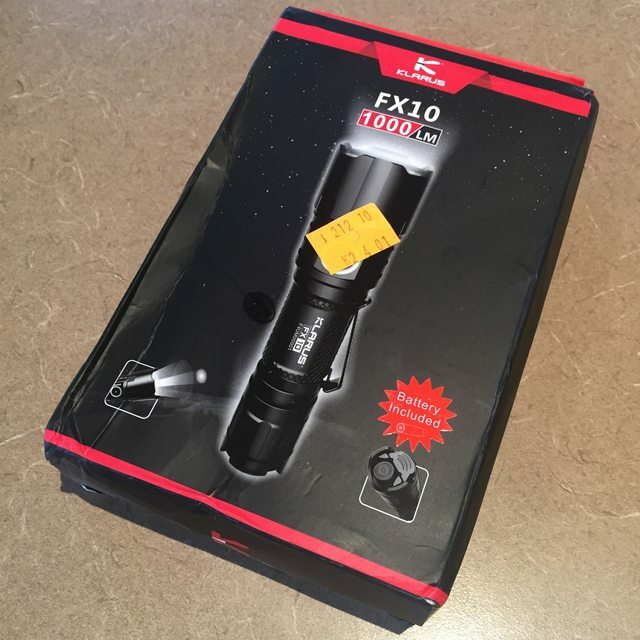 This is by far, the best zoom flashlight I’ve tested. However, due to lack of momentary functionality on all modes, and two frequency strobe, I am still looking for the “perfect” zoom flashlight. Outdoor beam shots at flood and throw, at100% output. f/5.6, 3secs, ISO400. Thanks for your review stephenk! Would be nice to have outdoor comparison with the Led Lenser, too. It seems to me that the Klarus has a “not so much zoomed in” type of beam! I dunno. I was looking at the beam shape in the side-by-side-lying-down picture. What it looks like to me is that the Klarus has a much wider (and much brighter!) hot spot coming out the front, but doesn’t look like it diverges as much. Maybe I’m seeing it wrong? I’d like to see the side-by-side-hot-spot-on-the-wall picture done again at 5 or 10 meters. The Klarus does seem to widen out more in flood mode, which a lot of BLFers will like. EDIT: The Klarus does seem to have brighter and wider angle spill than the LED Lenser in spot mode. Oh, I was going to say though, the Klarus looks like the illegitimate child of a Convoy C8 and Eagle Eye A6. PLUS a strike bezel. I have friends that would love it though. Both hotspots are actually a similar size at the zoom end but the Klarus has considerably more spill beam (both around the hotspot and outer spill). As mentioned in the review this is good for some purposes but not others. The Klarus has a much wider flood beam.